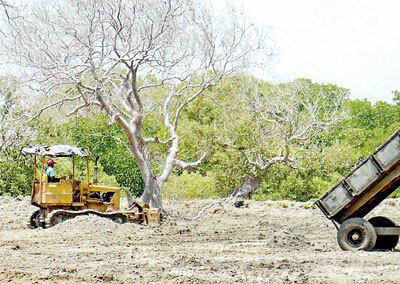 Despite mangroves being part of a vital coastal ecosystem protecting the shoreline from erosion, residents complain that heavy equipment has been used to completely destroy a lush green 24-acre mangrove at Puliyankudah, Kaka Adiya on the Mohoththuwarama Island in Kalpitiya near Puttalam. 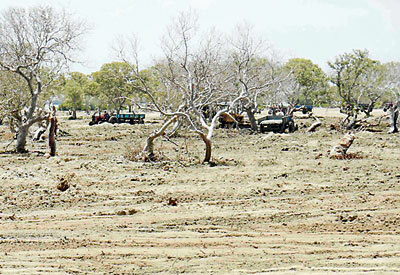 The desertification of a mangrove… who is responsible for this foul deed? The area is also rich in biodiversity and therefore clearing of mangrove forests is illegal. Convener of the Mohoththuwarama land protection committee A.M.A. Ayub said that the land is situated close to the lagoon and that there are reports that the land has been sold for three million rupees. He said despite informing the Divisional Secretariat,the Kalpitiya police and the Wildlife Conservation Department, none of these state institutions have taken action to prevent the destruction of this mangrove. Residents charged that mining is taking place on the island. When contacted the Kalpitiya Divisional Secretary Rangana Fernando said that the owners had not informed him of the ongoing activities. He said the Grama Sevaka of the area has been asked to submit a report. A.R. 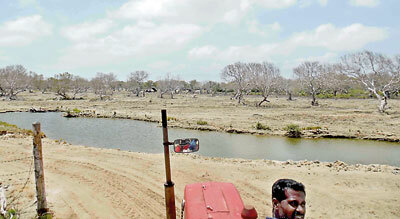 Ratnayake, a Wild Life Conservation officer of Kalpitiya said that even if the land belonged to a private individual,destruction of mangroves was prohibited.